Maybe you walked in on your parents wrapping presents from "Santa." 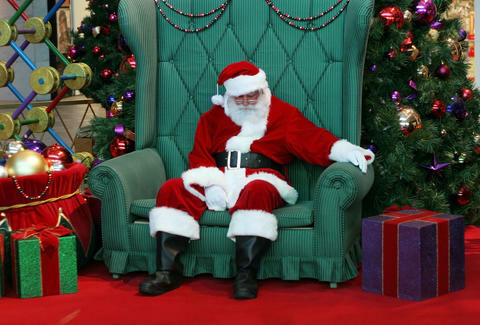 Or caught a glimpse of Kris Kringle taking a break from his duties -- and itchy fake beard -- at the mall food court. However it is you came to realize the truth about Old Saint Nick, you've got to admit that it would be pretty freakin' awesome if there were some jolly old dude who travelled the world dropping off presents one day every year. That's why this news is going to hurt: Santa Claus is dead. Like, dead-for-1,700-years kind of dead, according to archaeologists in Turkey who just found his tomb. In case you're a little fuzzy on Father Christmas's background, the myth of the bearded man in a red suit delivering presents to children is actually based on a real person: St. Nicholas. Officially, he was a Christian saint living in the 4th Century known as Nikolaos of Myra, and he made a habit out of anonymously giving out gifts. In the intervening years, his legend has only morphed and grown larger, to the point that his image is all but synonymous with one of the biggest Christian holidays of the year. For centuries, there has been a debate over where his remains truly lie, with many believing graverobbers relocated them to a holy site in the Italian city of Bari. However, experts maintain that the bones there are actually of a different priest, not St. Nick. And now, archaeologists surveying the Church of St. Nicholas in Demre (formerly Myra), Turkey, are convinced that a well-preserved shrine they discovered beneath it is where he's actually been entombed since he died in 343 A.D.
At the moment, the team of surveyors haven't been able to confirm their theory, since accessing the shrine is proving difficult. But, according to the BBC, they've brought in the figurative big guns -- a CT scan, geo-radar and eight academics -- to push through the final stages. No matter what comes of the findings, hopefully somewhere good ol' Mr. Claus is being treated to an eternity of cold milk and warm cookies.